The splendour of the Admiral's cabin contrasts sharply with the living conditions of the ordinary seamen on board Victory. Here, amongst the elegant decor reminiscent of the great country house, the Admiral entertained his senior officers and planned his strategy for the coming battle. In this cabin, Admiral Sir John Jervis dined with Commodore Nelson, Captain Calder, Captain Hallowell and Sir William Elliott on the eve of the Battle of Cape St. Vincent. Here, Jervis would have retired after the battle to write his dispatches to the Admiralty. In action, even the Admiral's cabin became part of the gun decks. The bulkheads were swung up and clipped to the deckhead to provide a clear space for action. Today this cabin remains in use as it always has been - as the Admiral's dining room. 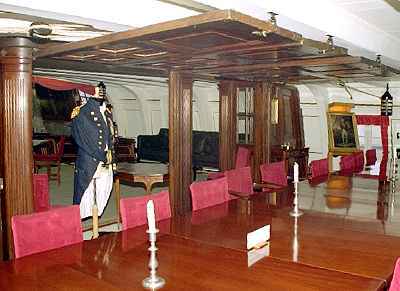 Commander in Chief, Naval Home Command, Second Sea Lord, flies his flag in Victory and entertains his official guests in this cabin. 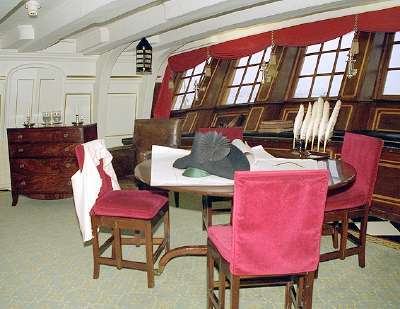 The Admiral had his own night cabin by the great day cabin and dining room. 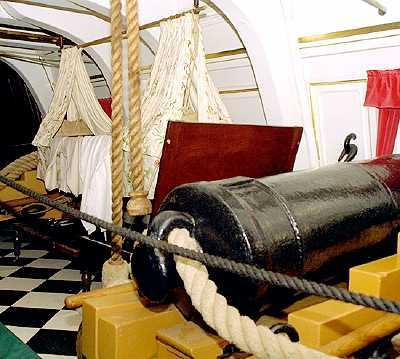 Admiral Nelson's swinging cot is shown here, with replicas of the hangings made for him by Emma, Lady Hamilton. The cot was made to measure, and was intended to serve as the officer's coffin if he was unlucky and died on board. The cot is suspended between two 12 pounder cannon. In action this space would be completely cleared and revert to being part of the upper gun deck.